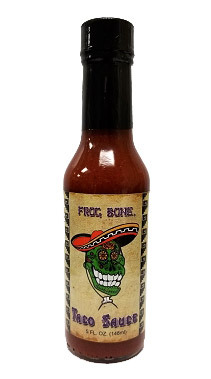 5oz bottle of Frog Bone's Taco Sauce. Great for adding taco flavor to any meat or seafood. It's also great on burgers, eggs, beans, sandwiches, pizza and chicken. Use this to add the great tasting flavor of tacos to any dish. This is a pre- mixed taco seasoning.